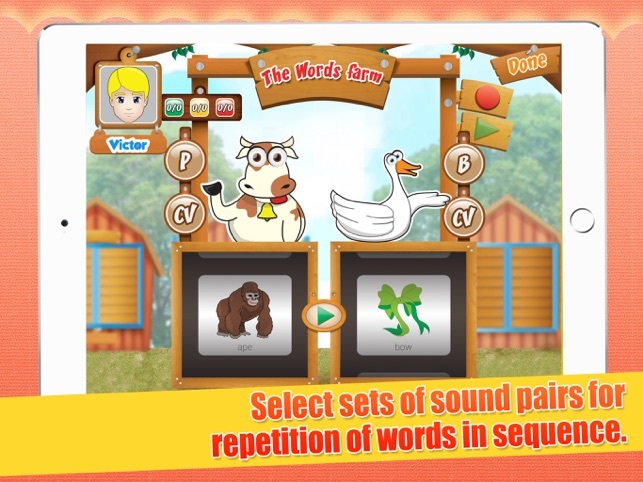 Apraxia Farm is a unique application created specifically to help children with childhood apraxia of speech and severe speech-sound disorders. 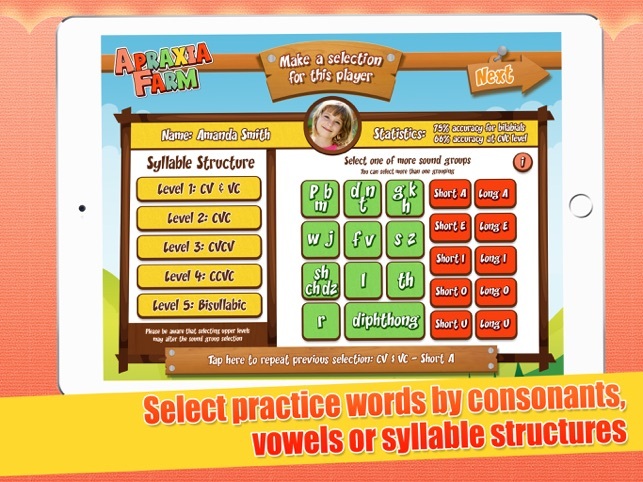 With multiple levels, both vowel and consonant targets, and the ability to create custom words, Apraxia Farm is perfect for those students struggling with sound production. 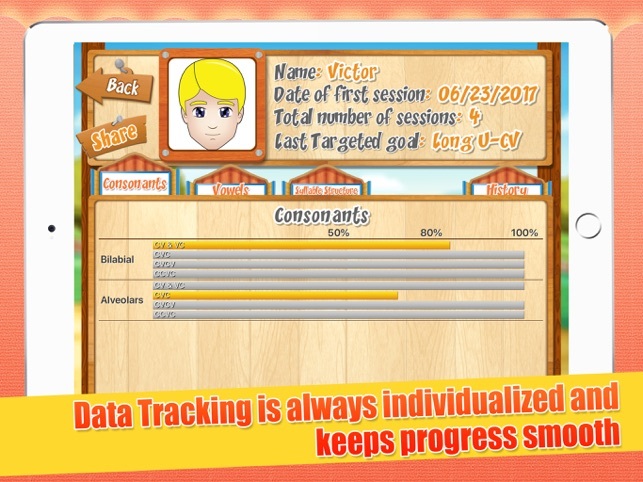 Designed by certified speech-language pathologists, Apraxia Farm provides video modeling of consonants and vowels, word targets by syllable structure (CV, VC, CVC & CVCV), customization of targets, and progress monitoring making it perfect for use by SLPs, special educators, and parents alike. 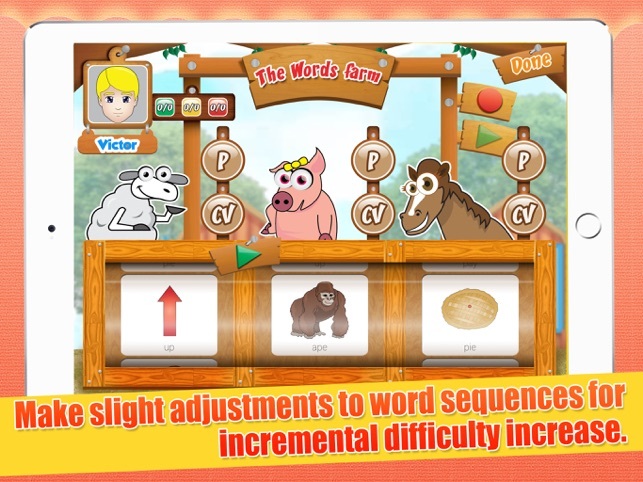 Apraxia Farm is designed for single or multi-player use. 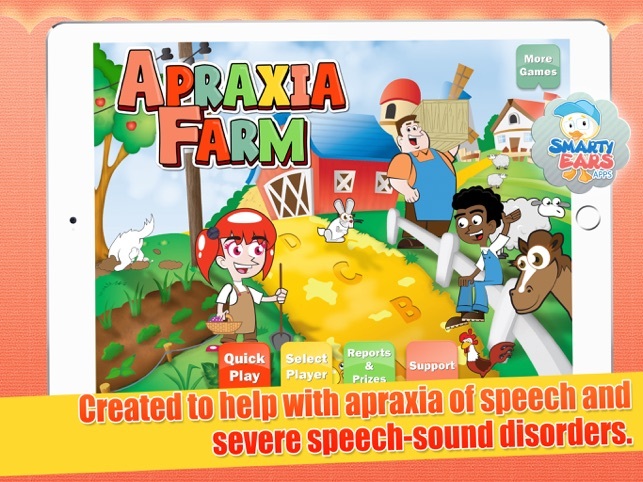 Players may be imported into Apraxia Farm from the Therapy Report Center or entered individually on the home screen. 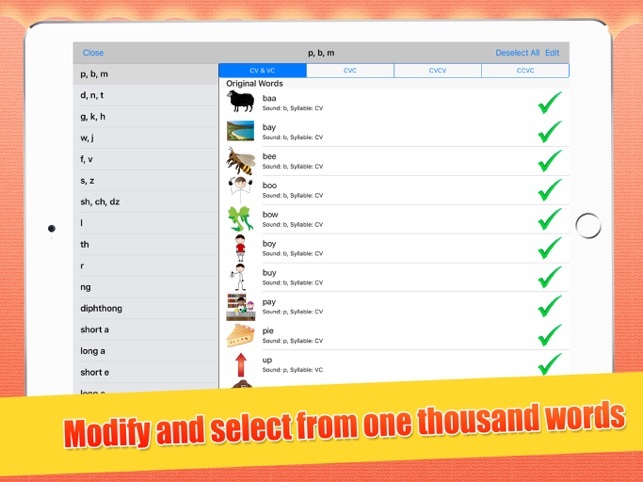 Up to four players can be selected with individual selections for targets in both sound groups and syllable structure. If the student has used Apraxia Farm before, the adult also has the option of repeating the targets from the previous session. Multiple students can work on different targets in the same session. The level of play depends on which area the adult chooses to visit. Apraxia Farm has three areas from which to select: The Sound Windows (sound production), The Farm House (single word production), and The Words Farm (multiple word production). Visual stimuli are present in each area from animated phoneme production in Sound Windows to multiple word pictures in The Words Farm. If the quickplay option is selected, the app moves directly into target selection. After the session is completed, the adult has the option of emailing/printing results or uploading directly to The Therapy Report Center. However, it should be noted that with the quick play option, no user data will be retained in the app itself. 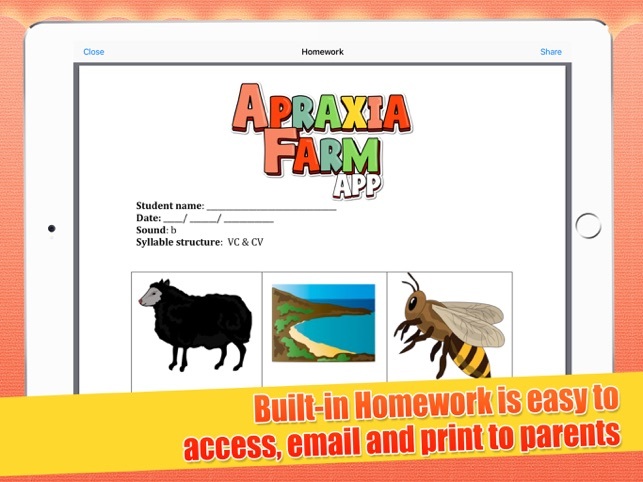 Apraxia Farm offer a very detailed data collection system. A graph is provided for easy progress monitoring. Apraxia Farm data collection reports can be exported to The Therapy Report Center. Apraxia Farm also creates backup data in iTunes which will allow it to be restored if for some reason the app needs to be deleted or a new iDevice is purchased. Apraxia Farm has a “settings” button on the home screen. The settings button allows the user to modify the word pool and allows the adult to select the specific words used for the session. A simple touch selects or deselects the word choice. 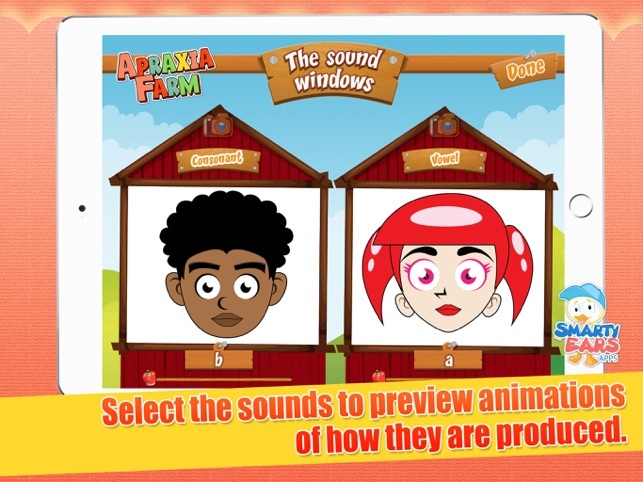 Add custom words: To help with functional communication, Apraxia Farm allows custom images to be added to the program. Adding a custom image allows for importing pictures relevant to the student (e.g., pictures of family members, teachers, pets, etc.). The adult then records the target word, selects the syllable structure, and the targeted phoneme. This custom word will then show up in the word list. Apraxia Farm was designed to assist in sound production therapy by utilizing technology to present sounds and words to students while collecting data. 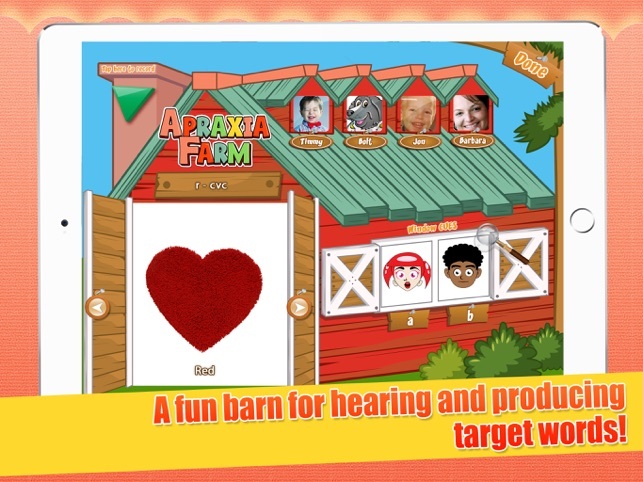 Because Apraxia Farm is a multi-user application it can be easily utilized for group sessions. Apraxia Farm allows data to be collected on multiple utterances for each student allowing for many productions to be used for maximum therapy benefit1 without losing the ease in data collection. Placement of the written word for each picture allows the SLP to incorporate a literacy component into therapy. Print referencing directs the students’ attention to the printed word in order to increase the metalinguistic focus of an activity3. Specifically, including the orthographic components while working on sound production, may aid in phonological awareness4. This is a great app to use during therapy sessions. I love how I can easily chose syllable shapes and sound targets to meet the specific needs of each of my students. In addition the ability to take data right in the app makes keeping track of progress that much easier. Lately I like being able to easily print out homework sheets targeting what we have worked on in therapy in order for parents to follow through at home! I'm a new-to-app alp. I am beginning to use Apraxia-Ville more regularly for a few of my weekly children for the past month. I still feel like a novice learning how to negotiate both an iPad and apps in general. I really appreciate the homework pages on this app. There are a lot of options for customizing the word pool for a child. I would like to have "VCV" and "VC" -only options. I see that I can get VC while working on vowels, and if I go through all the words for each sound I can eliminate sounds within the words that I don't want, but I find it cumbersome, time consuming. I think as I get more use to the word pool and how to set it up for each child it will work alright for me. I have to be able to work fast with my tots. 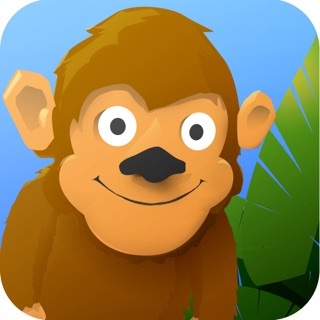 Speaking as an SLP in the schools who has other apps by this developer, I am extremely disappointed. 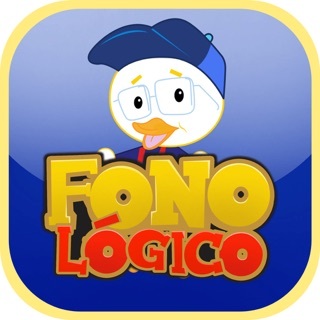 Performance-wise, the app is very slow, and after two days, has "crashed" and frozen and will not work any longer. When it was working, word choice within categories was poor, especially within bisyllabics. Complex words with shuffled in with simpler words, as opposed to more appropriate sub-categories to work through. Button design was not at all intuitive, making data collection a challenge when one needs to keep the session moving. I would not recommend this app, and only wish I could get a refund.